A close examination of healthcare in America leads to the inevitable conclusion that patients are one of the least important players in the healthcare system. I’m the first to admit that this claim is both counterintuitive and provocative, but hear me out. The evidence could not be clearer. This is particularly ironic because the healthcare field is staffed with professionals who were attracted to the field specifically to provide patient care. The problem does not lie with the people in the system; the problem lies in the system itself. Unlike every other developed country in the world, healthcare in America is treated as a profit-making operation. This is true for profit making institutions as well as the non-profit or not-for-profit healthcare organizations. Rather than talk about profit, these hospitals talk about a “surplus” that is required to see the hospital through lean times and fund the purchase of new equipment or grow the institution. This is the first in a series of blogs that will provide ample evidence of this remarkable claim. Stay tuned. Turning a profit is baked into the very DNA of the American culture. It is part of what it means to be an American. Healthcare is no exception. But unlike every other business in the country, in healthcare, there is remarkably little focus on the holistic welfare of patients. Every other business in the country – and most throughout the world – have customer service centers that are tasked with handling customer problems as they arise. Customer satisfaction is paramount. At the end of every call I make to customer service departments, the agents always ask, “Is there anything else I can help you with?” That question rarely comes up in healthcare! Let me give a few examples of the extent to which healthcare in America is a profit-making industry rather than a service to the community. Hospitals develop what they call “master charge” lists. These are the prices they propose charging for patients admitted with various admitting diagnoses. In fact, these lists are just starting points for negotiations with insurance companies. During the negotiations, the insurance companies will negotiate deep discounts from these lists and the negotiators will be seen as heroes because they were able to win those discounts. But the negotiation is highly misleading because the “master charge” lists are created only for the purpose of negotiating with the insurance companies. Hospitals and health clinics don’t have any solid data about what it really costs to treat medical conditions because they don’t have cost accounting systems that allow them to develop those costs. They make these lists up out of thin air. Medicare and Medicaid don’t pay according to these lists. They ignore them. The federal government pays according to its own payment schedule. Hospitals have the choice of charging the government in line with those government payment schedules or not taking Medicare and Medicaid patients. Most hospitals are willing to work with the government payment schedules. The “master charge” lists vary considerably from one institution to another. This is true for institutions of comparable quality and in the same geography. Further, unlike restaurant menus, these price lists are rarely shown in advance. This makes comparative shopping impossible! But even if the “master lists” were available, it wouldn’t make much difference in most cases. When a relative is screaming in pain and terrorized by her imminent death, her relatives are unlikely to show the same due diligence in selecting a healthcare provider that they would show, for example, in buying a new car. They only patients who get hit with the “master charge” prices are poor people who can’t afford to buy insurance in the first place. Relatives may take an ailing relative to the hospital in a moment of desperation and sign whatever pieces of paper are put before them. They may not realize they’ve signed legally binding financial commitments with no upper limit. When the bill comes it could be in the five figures for something as simple as a paper cut. Anything halfway serious is liable to be in the six digits. And the hospitals and clinics are serious about collecting on their bills. They retain a cadre of well-paid debt-collecting lawyers who are first-rate at what they do. First, they take the sponsor’s savings accounts. Then they go after her retirement funds. Those are easy to pick up. Then they take her home. A sponsor who tries to declare bankruptcy discovers that healthcare bills – like education loans – are exempt from bankruptcy. That means that no matter how little money she may have or how little she may earn, she can’t escape healthcare bills through bankruptcy. It’s not even worth thinking about. This aggressive bill collecting effort is a clear sign that the welfare of the healthcare institution, not the patient, is what is at stake. I am not trying to argue that people should not pay their bills. But having a different set of rules for collecting healthcare debts than for collecting all other debts tells me there is a double standard. This odd situation doesn’t mean that hospital administrators are acting in a malevolent way. It means they are acting in a way that our laws and customs endorse. Those administrators have a fiduciary responsibility to their Boards of Directors to collect all the money owed to them. They would be negligent if they did not try collect every account as vigorously as possible. For the last hundred years or so, general practitioners and specialists have charged on a fee-for-service basis. That means exactly what it says: doctors provide services and bill someone (i.e., the patient, an insurance company, the government) for the service provided. There is no requirement that the service needs to be required in order to improve their patients’ medical condition. None whatsoever. Often hospitals or clinicians carry out tests not because they contribute to their patients’ well-being, but because they protect the medical community in the event of a legal suit. Typically, patients approach GPs with a complaint of some type. The GPs will refer the patients for a series of tests that they believe will contribute to the patients’ recovery. Often, they also refer their patients to specialists. The specialists may order even more (and often more expensive) tests than the previous tests. In the end, it really doesn’t matter whether the patients improve or not – although there is a universal hope that the tests and procedures will lead to improvements. But, regardless of the outcome, the laboratories, medical practitioners, and hospitals all charge – and collect – for the work they did, not the results they deliver. In no other industry will professionals, executives, mechanics, or salesmen get paid for their activities without respect to the achievement of their end goals. Healthcare is unique in this respect. To put it more bluntly, the welfare of the patients is simply not a key factor in the operation and economics of the healthcare system. I believe that every individual in the system acts in good faith in contributing to the welfare of their patients within the protocols of their professions, their institutions, and the law. Each professional likely plays her own part as well as possible, but the system rarely assigns any one individual to look after the welfare of the patient in a holistic sense. This is a sign of a problem with the system of healthcare in America – not the administrators or medical staff. If we are completely honest, we need to acknowledge that, with the exception of public health (which is a marginal component of the overall healthcare system), our healthcare is not primarily concerned with promoting health. There’s no money in it. The real money is in treating patients after they get sick, suffer from cancer, sink into a preventable chronic disease, or break a bone. That’s where the big money is. Saving lives and working minor miracles is heroic. “Illnesscare” galvanizes everyone who witnesses it. But promoting health by recommending improvements to diets, exercise programs, or cleaning up the environment really doesn’t carry the same WOW factor. It is routine and undramatic. But that is truly right at the heart of healthcare and as far removed from “illnesscare” as one can imagine. My claim in the first paragraph that patients are the least important part of the system of healthcare in America needs a lot more justification than I’ve given here. I urge you to read the entire series of upcoming blogs about how the healthcare system works (or doesn’t work). You will learn that we have one of the most expensive and least effective systems in the world. You will learn that our government agencies mandated to protect our health often do exactly the opposite. (And these dynamics started long before Trump came on the scene.) You will learn that Americans are among the least healthy demographic on the planet – and that this poor health is driven by policies that are known to be counterproductive. It is not driven by callous healthcare staff. Further, what you will read in this healthcare series is NOT a conspiracy theory or a secret. Far from it. In fact, everything I’ll talk about is well known and published in articles and books that anyone can read if they choose to. But, given the pressures of everyday life, people just don’t have the time, energy, and motivation to learn about the greatest threats to their health. A look at healthcare delivery quality through hospital readmission rates. Ironically, I would say that this claim is both true and false. There are good reasons to treat 30-day readmission rates as a reliable surrogate for poor healthcare delivery. But there are equally good reasons to treat this arbitrary metric as completely misleading. We will explore both sides of this argument. Part 1 of this blog will argue that 30-day readmission rates are a reliable guide to the overall quality of the healthcare provided. Part 2 of this blog will argue just the opposite: 30-day readmission rates are a bogus measure of the healthcare provided. The most compelling argument in favor of using the 30-day readmission rates as a metric of quality comes directly from the Centers for Medicare and Medicaid Services (CMS). CMS claims that of the total $26 billion it pays annually for readmissions, $17 billion of that figure is for avoidable readmissions. One in five elderly patients returns within 30 days of discharge. These are staggering numbers and, if true, are a strong indictment of the healthcare industry. Further, this is the figure only for Medicare and Medicaid readmissions – a minority of all hospital admissions. Since there is no organization charged with tracking the costs of readmissions for those with private health insurance or no insurance at all, we will never know the full extent of avoidable readmissions for all patients. High readmission rates have been tracked to poor communications between hospitals and their discharged patients. Patients are often discharged with little explanation about the medications they are to take or the pain they will experience. Post discharge pain is particularly severe for patients with hip and knee replacements. Patients who expect the pain, know that it is normal, and know how to manage it are far less liable to return to the hospital than those who suffer pain and believe something has gone wrong. There are other examples of poor communications that lead to rapid readmissions. Some patients who are admitted for chronic obstructive pulmonary disease have their condition treated and are discharged promptly. But the hospital personnel fail to tell some of those patients to stop smoking! They continue to smoke and return to the hospital promptly. Better communications at discharge about the need to stop smoking would make these readmissions unnecessary. One patient suffered from type 2 diabetes for 14 years. She showed up at the hospital because her blood sugar was out of control. She got patched up and was back on the street again – but with no idea how to administer her insulin or manage her diet. Wham! She was back in the hospital again. This time the nurses and dietician showed her how to handle her insulin and how to change her diet. This was the first she had heard of these things in 14 years. Strange but true. Some research indicates that 30-day readmissions could be reduced by 5% simply by improving communications with the patient prior to and at discharge while following a defined process of care protocol. This is a cheap solution to an expensive problem. If the solution is so obvious, why hasn’t it been widely adopted? Well, it really boils down to the way our healthcare system is organized. Each of the participants in the system does his or her job as they were trained to. If the system doesn’t focus on clear, thorough communications at discharge, it won’t happen. But that is changing. Now that CMS is tracking readmission rates, financial penalties are applied regularly, and research uncovers the underlying reasons, the system is changing. Again, we need to point the finger at the hospital protocols, not the individual practitioners. Half the Medicare patients do not see their general practitioners or a specialist during the first two weeks after their discharge. We have no numbers for non-Medicare/Medicaid patients, but it is reasonable to assume that the story is somewhat similar. This lack of follow up leaves patients who suffer problems – real or imagined – little recourse but to return to the hospital where they received their most recent care. Most of them don’t know what else to do. Medical and nursing training focuses on the technical aspects of healthcare. This training focuses on the “evidence-based” aspects of what works and what doesn’t. Since there have been few (perhaps no) studies of the importance of patient/clinician based interactions, patient communication hasn’t attracted the attention it should as an important factor in long-term healthcare. But even if there have been no studies to validate the importance of those communications, common sense should have done the trick. In any case, the culture is likely to change. Hospital staff will pay more attention to discharge communications in the future. Collectively, this means that it is costlier and more time consuming to deal with these patients. When hospital readmission rates were not measured, there was no financial incentive for hospitals to make special efforts to deal with these demographic groups. But now that these statistics are measured and reported publicly and there are financial penalties, we are likely to see hospitals take the steps necessary to minimize readmissions with this demographic. This does not suggest that hospital administrators were negligent in the past. Rather, it suggests that they were responding to public evaluation and financial metrics that made sense at that time. Once we change the system, we change behaviors. This is an old management bromide that applies directly to hospital readmissions. Until the CMS started focusing on hospital readmissions, the issue simply escaped notice. Since it was never an issue, it was never addressed. It was only when healthcare administrators found that their institutions were evaluated and financially penalized with this metric that they focused on it. That is normal. Measuring 30-day readmissions and penalizing the worst performing 25% brought a focus to healthcare quality that has been missing for the last three millennia. The fee-for-service payment model that has been used in this country since day one has never brought light to bear on the quality of healthcare. We have always automatically assumed that all clinicians showed superb judgment and did all that can be done. This uncritical attitude never held anyone in the healthcare field accountable for actual results. Now, here’s the important point: By pointing a spotlight on high readmission rates and putting penalties in place to penalize poor performers, the federal government believes it can change behaviors. The rise of Accountable Care Organizations to address this issue is unlikely to have occurred without this sort of impetus. Further, there is evidence (The Revolving Door) that this new-found attention is, in fact, changing some behaviors at the community level. In other words, by measuring readmission rates, hospitals find that they can improve their performance on this metric. If patient demographics and healthcare delivery systems were homogeneous across the country, we would expect to find the same rate of readmissions uniformly everywhere. That is not the case. Rather, we see a lot of “lumpiness.” In other words, the rates or readmissions to hospitals are determined to a surprising degree by where patients live. 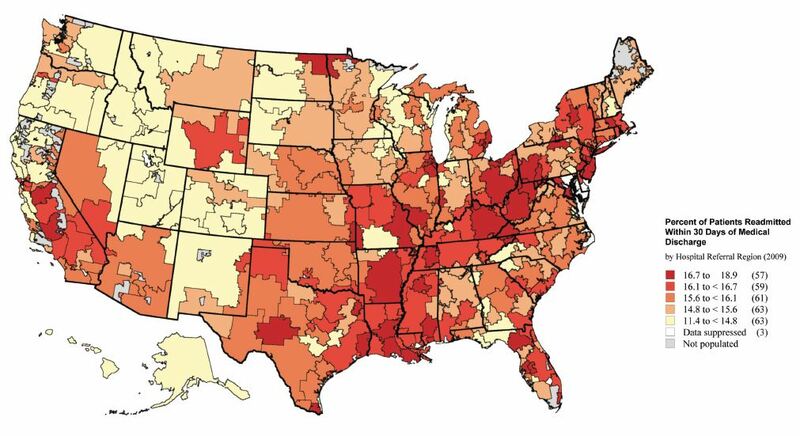 The map below shows the intensity of readmission rates within hospital referral regions. Further, some places treat their hospitals as a routine site of care. In other words, it is normal for those in some areas to go to the hospital rather than doctors’ offices or community clinics. Here is something else I find interesting. If you look at the readmission rates for any one of the five factors I listed immediately after the first paragraph above, you’ll find that the readmission rates for the other four factors are nearly the same for hospitals in the same geographic region. This correlation suggests that there is some dynamic at play that is independent of the illnesses and chronic conditions in the region. In other words, the patient is not at the hub of the healthcare system. It requires some judgment to stand back, look at this disparate information, and draw conclusions. In fact, different people are likely to draw different conclusions. Nevertheless, I think it’s reasonable to say that 30-day readmission rates can be used, at a minimum, as a rough measure of quality of care. The rise of Accountable Care Organizations (which we will discuss later) and the fact that hospitals have been able to shift their position significantly on the readmissions scale suggests that improvements are possible if we develop the right metrics, measure all hospitals by the same yardstick, and provide rewards accordingly. Medical mobile apps are transforming the Healthcare Industry, promising to improve quality of healthcare while lowering costs. In 2017, global medical healthcare apps were a $26 billion industry with a global average CAGR of 32.5%. The United States currently has the largest market for mobile medical apps. However, the Asia-Pacific region is showing the fastest growth rate in the world – with an estimated average CAGR of 70.8%. By 2022, the worldwide mobile medical app market is anticipated to reach a $102.43 billion. As of 2017, mobile healthcare apps have been downloaded over 3.2 billion times – this marks a 25% increase since 2015. In the United States alone, there are over 500 million smartphone users with mobile health-related apps. The greatest growth in mobile medical apps has been in the management of chronic care – particularly diabetes, obesity, high blood pressure, cancer, and cardiac illnesses. As the prevalence of chronic illnesses worldwide increases, so is the increase in medical apps created to help manage these chronic illnesses. Nearly half of all Americans, around 133 million individuals, currently live with a chronic illness. Per the Centers for Disease Control and Prevention, now seven of the top ten causes of death in the US are due either directly or partially to chronic illness. Chronic illness is on the rise globally as well. According to the World Health Organization, as of 2017, over 79% of all deaths related to chronic illness occur in developing countries, and this rate is anticipated to continue to climb. Heart diseases and other cardiovascular illnesses will continue to be the major cause of mortality throughout the globe. Asia, in particular, is experiencing the greatest rise is cardiac disease and death due to heart-related complications. The widespread availability of tablets and smartphones in healthcare today is what is helping spur the use of mobile healthcare apps by patients and providers alike. According to referralmd, over 80% of physicians in 2017 use their smartphone at the point of care – whether for patient services or for administrative reasons. The wide access to and use of smartphones by providers and patients alike has been the primary driver behind the increasing availability of mobile healthcare apps year-over-year. How can mobile apps help? What kind of mobile apps do patients want? And which kind do physicians need? The healthcare industry is filled with opportunities for digitally savvy companies and mobile app developers.